January 5, 2011 -- Members of the new National Digital Stewardship Alliance gathered for a two-day workshop, held December 15-16, 2010 in Washington, DC, to discuss how the NDSA will be structured and function as a collaborative, volunteer organization. Members of the NDSA at the workshop. Credit: Abby Brack. Over 30 members representing government agencies, educational institutions, non-profit organizations and businesses participated in group discussions at the workshop focusing on what the core values Alliance should be, how new members will join the Alliance and how the Alliance will conduct business. The goal of the workshop was to make decisions about the basic structure of the NDSA. Prior to the workshop, the member volunteers worked virtually to develop a draft set of recommendations for the Alliance mission and values, membership model and governance structure. Those recommendations were discussed and reviewed during the workshop. The Alliance is an initiative of the National Digital Information Infrastructure and Preservation Program, which the Library of Congress has administered since 2000. In establishing the program, Congress directed the Library to work with other federal agencies and a variety of additional communities to develop a national approach to digital preservation. 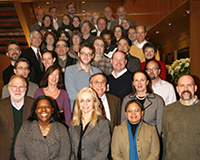 The NDIIPP Program has worked with over 185 partner organizations to establish strategies and take action for long-term digital preservation resulting in selecting over 1,400 at-risk collections and developing over 36 tools and services by the end of 2010. Sixty original NDIIPP partner organizations became founding members in the Alliance, and 35 members volunteered to assist with the organizing activities of the NDSA leading up to the workshop. This work demonstrates that a collective effort of networks with shared interests and trust can achieve far more than individual institutions working alone. The Library of Congress serves as the Alliance secretariat with NDIIPP staff providing program support. More information about the Alliance, including the option to express your interest to join, can be found at: www.digitalpreservation.gov/ndsa.